The Art of Candy Stripping and the Trumpet Player on the Moon	Why Publish a College a Day? If the title of this post sounds familiar, you’ve probably seen Chitty Chitty Bang Bang at some point in your life. But the topic today is not Benny Hill’s acting career or whether Toot Sweets would have made a great candy. We’re here to talk about how much access we have to FREE information during the College Search process. And if the topic seems somewhat familiar, I’ve touched on the availability of free “stuff” both in my “Unexpected Friends” post on 11/10/10 and my “One Night in Plattsburgh” post on 12/15/10. I think it’s a topic worth emphasizing. You pay enough for college. It’s a fantastic investment, but it is rarely cheap. Therefore, families look for any savings or deals they can find. However, when it comes to the information and services needed during the search for College, families often end up paying for things that they could have obtained for free. Or they don’t obtain the information or receive the service at all because they think they can’t afford it. 1) Guidance Counselors and the Guidance Office – Ultimately, your taxes (if your child attends a public HS) or your tuition dollars (if he or she attends a private school) do pay for this, but in terms of direct costs, you have a paid staff professional staff member, support staff, paper and electronic access to thousands of books and other periodicals about colleges and the college search. All at your disposal, with no admission price. While many are overworked and some are better than others, in general, you have a committed, educated, caring person (or two or three) willing to help you achieve your goals. 3) The FAFSA – It is the FREE Application for Federal Student Aid. Free. No Charge. It does not cost you a dime to find out if you are eligible for federal grants, loans and scholarships. If you pay anyone to fill out a FAFSA for you, you should pay only for the convenience of not spending 45-60 minutes filling out a form. Anything more expensive than that should be filled under wasted money (or, in some cases, fraud). I would strongly suggest that you NEVER pay someone to complete a FAFSA for you. 5) The Library and – to some extent – Barnes and Noble – Some of the Colleges that you are looking at can be pretty far away. And your guidance office might not have EVERY College Search book (although I bet their catalog matches the library and B&N). But the hours, quiet, convenience, and – in the case of Barnes and Noble – beverages and pastries (those are not free) – allows you to do your college research in a relaxed environment without the distractions of a high school guidance office. And, if you are a parent reading this (like, I suspect most of you are), then I assume you would definitely prefer doing research someone other than the high school guidance office. 6) The World Wide Web – From www.fafsa.ed.gov to www.finaid.org, there are a plethora (trying to use that word in all my blogs now) of excellent online financial aid resources – all free. In fact, that is the clearest indication that the site is worthwhile and legitimate. If it costs something, run away. But, also keep in mind that each college has a detailed website with courses, costs, admission policies and much, much more. As well as – for most of them – Facebook pages and YouTube channels and Twitter accounts…. 7) Viewbooks and Videos and Flash Drives and Catalogs and Search Pieces and Brochures – I’ve covered this a bit in the other bullet items above, but the Colleges (other than a few print catalogs) are not charging for their information. They want you to have it. Many trees die, as it were as millions of viewbooks and brochures are mailed out handed out to people like you. All free. And while they are generally glossy and filled with slogans, there is usually quite a bit of nutritional value beneath the candy coating – courses and mission statements, career paths and student service options, and much, much more. 8) Family and Friends – More so than at any other time in history, you know people who went to college – friends, family and neighbors. And they are not being paid by a college. And they are usually more than willing to “tell it like it is” (or was). Just bear in mind that the information is from their unique viewpoint and may be outdated, if they went to school a few years ago. 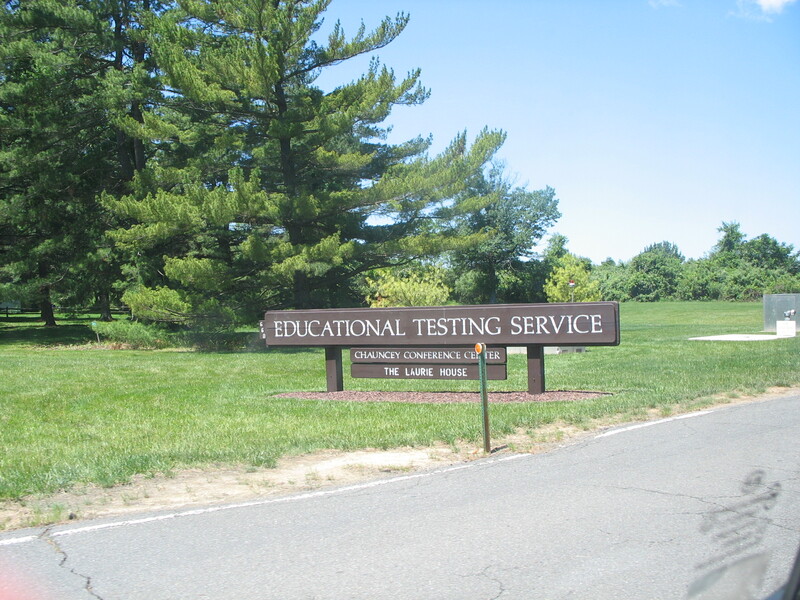 The Educational Testing Service's "Secret Lair"